StoP » English » What is StoP about? “StoP“ is the abreviation of the German words for: Neighborhoods free of Intimate Partner Violence. 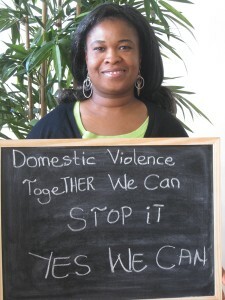 In English it could read: Say no to Partner Violence! “StoP” is about “community mainstreaming” of the issue of Intimate Partner Violence. Using methods of community organizing and community learning we focus on local neighbourhoods and informal social networks as important resources to prevent and reduce IPV. “StoP” is innovative because it combines professional knowledge about prevention of Intimate Partner Violence and community development/community organizing. “StoP” is a new neighborhood based approach to prevent and reduce domestic violence. It is about “community mainstreaming” of the issue using the method of community organizing. Social networks/neighbours are crucial in preventing DV and supporting victims but this potential has been neglected so far. “StoP” answers to the fact that many people have limited access to services because they are rare or far away, because of cultural or linguistic barriers or distrust of social service and government systems. Mostly, people turn to informal networks of family, friends and neighbors for support. So it is important that ordinary people, not only proffesional helpers know what to do and what to say. And: Neighbours are the ones who are near by when domestic violence happens. Sometimes a quick reaction means an important difference. Not only close friends – often it is neighbours who hear, know or at least have a suspicion about what is going on. Their attitudes and reactions have an important influence on the way people act. They can encourage disclosure and help seeking and stop violence. Studies prove that the rate of lethal violence against female partners is higher in neighbourhoods where the norm of non-intervention is strong. Police and Social work cannot do the job alone. It needs a strong civil society. And that means ground/ grassroots work: face to face communication, not sitting in offices but reaching out, doing door knocking, being present in shopping centers, playgrounds and in the street, bringing neighbours together, empowering people to speak out and take action, supporting victims and paying attention. This is what “StoP” successfully has been doing during since 2010 in low income neighbourhoods in Hamburg, Germany. We would like to help others to do so too. We offer training programs and counselling.